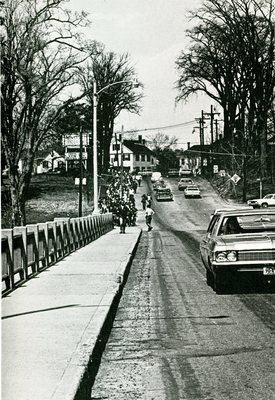 "Orono, Maine, Bridge Leading to Campus "
An image scanned from a black and white print of students beginning to make their way across the bridge from campus to downtown Orono. The sign at the hotel at the top of the hill reads, "University Motor Inn." Part of a series of photographs of a student protest of the Vietnam War that were included in the university's annual Prism yearbook for 1970.